Farmland preservation is not a simple process. There are many steps and numerous players that will be crucial to a successful outcome. Callithea Farm in Maryland was a prototype in the late ‘90’s for how a citizen’s group could save a community resource and a cherished family farm from immediate threat of development. A five-year process made Callithea Farm an historic equestrian land conservation success story, but its future as such is not necessarily secure. Callithea Farm was a 97 acre horse property near the Potomac River in semi-rural Maryland. Victor Vournas purchased the farm in 1937 as a weekend retreat and later developed it into a stable and boarding facility. Located in Potomac, Maryland the farm borders Blockhouse Point State Park on the east and the C&O Canal National Historical Park on the south and western boundaries. The lands provide habitat and food for bald eagles, deer, red fox, red-tailed hawks, owls and other wildlife. When Vournas died in 1996, Callithea’ s then farm manager, George Sengstack, and a boarder, Dave Tobin, raised concern about its future and the very real possibility that the land could be sold to a developer as a wave of suburban sprawl made its way up the Potomac gobbling up unprotected properties at an unprecedented rate. The family wanted to preserve Victor’s legacy but the expense of upkeep and taxes gave them little hope of maintaining the property indefinitely. All agreed that professional land conservation help was needed. Sengstack and Tobin enlisted support from The Conservation Fund (TCF) which helped to launch a five-year process in which a number of individuals and local civic groups played important roles in rallying the support of elected officials. In 1998, armed with a prospectus describing Callithea Farm’s conservation and equestrian value, they contacted The Conservation Fund in Arlington, Virginia seeking its expert advice and assistance. TCF had, at the behest of several activist equestrians concerned about the loss of open land for riding, recently initiated a new program called Equestrian Land Conservation Resource (ELCR). After numerous discussions, a strategic plan was developed with ELCR’s assistance that covered valuation, negotiation with the family, tax implications, research for possible funding sources, and acquisition strategies. Utilizing the legal expertise of another Callithea equestrian and boarder, Tobin and Sengstack established the Friends of Callithea Farm (Friends) as a 50l(c)(3) non-profit organization. Tobin was designated as its president, and Sengstack as vice president. Friends’ charge was to work with the owners of Callithea in order to conserve the farm for public use and to operate it in perpetuity as a horse farm and public resource for equestrian and compatible purposes. Private donations were solicited to help defray expenses and an appraiser, familiar with state and federal land acquisitions, was sought to determine the market value of the property. Friends began to contact a number of local authorities seeking their partnership and support. ELCR met with the Superintendent of the adjacent C&O Park and the Trail Planner for the Montgomery County Department of Parks. At a meeting with Friends and the Vournas family the Potomac Conservancy expressed interest in supporting the protection effort with fundraising efforts and agreed to hold any easements that might be placed over the property. A letter writing campaign was initiated in 2001 calling on the Montgomery County Planning Board and the Maryland National Capital Park & Planning Commission to designate Callithea Farm as open space and set the land aside for conservation in the Potomac Planning Area. Letters of support came from state delegates, a state senator, the Potomac Conservancy, the West Montgomery County Citizens Association and numerous private citizens. In March/April of 2001 the Planning Board heard three days of oral testimony on the Potomac Master Plan and reviewed more than 1,000 letters of written testimony before submitting its final report in May. One of the highlights of that plan included approval to designate Callithea Farm as a public park. Friends of Callithea Farm approached Maryland’s Rural Legacy Fund as one source of public funding that could be applied to the purchase of the development rights for the farm. At the same time, Friends worked with Montgomery County Agriculture to begin the process of incorporating it into the county’s Rural Legacy boundary. When Legacy funds are used to protect lands, they are generally held or co-held with the Maryland Environmental Trust to ensure the permanent protection of lands paid for with public funds. Friends notified the Trust of its intent to protect this property and requested the Trust’s advocacy. With the successful inclusion of Callithea Farm in the Montgomery County Potomac Master Plan, work began on a draft contract for the purchase and sale of the farm. A multi-year purchase contract was drawn in November of 2002 which considered the specifics of the conservation transaction, including a phased acquisition that satisfied the tax strategy for the Vournas family. The contract rested on TCF as the intermediary purchaser with funding coming from the Maryland National Capital Park and Planning Commission annual budget for land protection. Closing on the purchase contract was contingent on exercising a decades-old right of first refusal owned by the purchasers of an adjacent 40 acres that were subject to development. While clearly unable to exercise their right and meet the conservation terms of the contract, the owners of the right unexpectedly chose to challenge the legality of the county’s acquisition and took the farm’s owners, the county and The Conservation Fund to court]. In 2003 the court ruled in favor of the defendants [http://www6.montgomerycountymd.gov/content/countyatty/App%20Briefs/stamoulis.pdf]. The first phase of the five-year purchase was completed in July 2003. In 2012 Callithea Farm represents to many in the conservation community the penultimate reward for their hard, slow work: it is the same as it used to be…almost. The farm continues as a boarding facility in the Potomac area. It has a month-long waiting list for boarding clients eager to bring their horses to the coveted rolling green pastures. It even has its own Facebook page. The youngest Vournas daughter still lives on the property via a 20-year estate there and the farm manager still runs the boarding business under a 20-year management agreement. 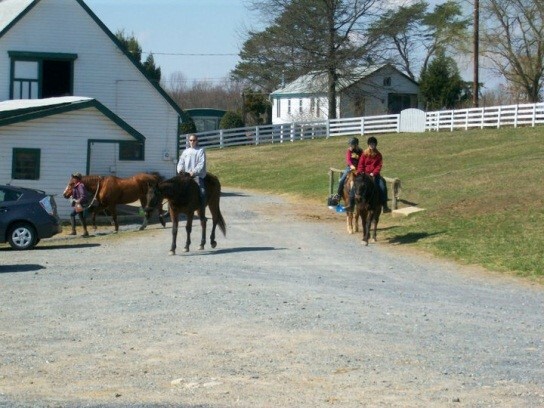 The Farm is part of the Montgomery County parks system, along with several other strategic horse facilities that include Meadowbrook Farm, leased to a nonprofit that pays rent to the parks department; Wheaton Stables, an established urban facility; the Potomac Horse Center, leased to the same manager for the past seventeen years; Rickman Farm Horse Park, whose land was donated to the system with the stipulation that it be used as a therapeutic riding center; and, Woodstock, a passive use facility with sixteen miles of trails, outdoor arena and cross country course. Much of the acquisition funding came through tax-exempt bonds. Like everything else in the parks system these equestrian facilities are subsidized by taxpayers, although they generate rent, pay revenue and are required to do a certain amount of maintenance and capital improvements. Is Callithea Permanently Protected Against Development? In hindsight an equestrian use easement could have been placed on it at the time of sale to Montgomery Parks. However, Callithea Farm is designated as a ‘Special Park’, and protected as parkland from development, for the time being, through its participation in the parks system. It is parkland in a county that doesn’t sell parkland, but the question is, how protected is it as a horse farm? It is not necessarily guaranteed that the use of its land as an equestrian facility will be maintained. If the Parks Department, in response to public demand, identifies another use for the property, the lease can be terminated. If Montgomery Parks did begin a process of considering an alternative use it would be restricted by the funding source (Program Open Space) used to acquire it. Any change must also be consistent with long term planning (such as Vision 2030) or an existing master plan for the park or the process of updating an old master plan, and the mission of Montgomery Parks. It is also subject to public comment that would include equestrian groups, such as Equestrian Partners in Conservation, voicing opposition to any change from equestrian use. It is unlikely that a horse farm easement that could be placed on the property while it remains in the park system. But as long as there is an interest within the community to maintain its equestrian activities and to use the parks system, Callithea and the other horse parks will remain.